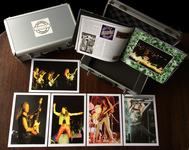 Bob Sawyer — one time guitarist with both Iron Maiden & Praying Mantis tells his story covering the previously uncharted depths of the early days of both bands with all the gigs recalled from Bob’s own archive, including previously unpublished photos. This unique account details Bob’s musical journey from the early seventies to being the guitarist in Iron Maiden during the band’s formative years in the midseventies — before they had even signed a record contract. The band gigged relentlessly in an around their native East end of London, where they regularly played the pubs and clubs such as the Cart & Horses and Bridge House. 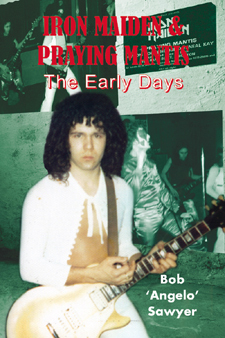 Although Bob left Iron Maiden before they were signed to EMI, the advent of a surge in this genre dubbed the New Wave of British Heavy Metal saw Bob touring with one of the chief exponents Praying Mantis as part of the 1980 Metal For Muthas Tour that included bands such as Motörhead, Saxon and Samson, as well as his former band Iron Maiden. 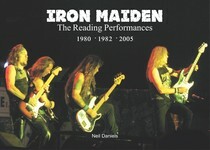 Bob also picked up with Iron Maiden again when Praying Mantis toured as the support act on Maiden’s first headlining tour. Bob kept diaries, which now published in this book, give a great behind the scenes look at the formative days of not just these bands but of the enduring heavy metal movement as well.